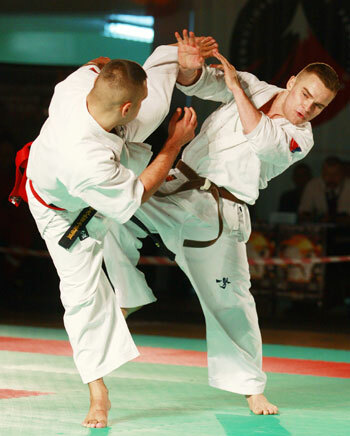 Polish Cup OYAMA TOP in knockdown as well as Junior and Senior Polish Cup OYAMA Polish Karate Federation in Semi-knockdown took place in Jelenia Góra, both were under the auspices of Shihan Jan Dyduch 7th dan- the director of OYAMA Polish Karate Federation (OYAMA PKF). About 200 female and male fighters, representing 31 Oyama karate clubs and 3 Kyokushin-Tezuka Group clubs, took part in the 2-day-long tournament. The event was organized by Jeleniogórski Klub OYAMA with its leader Sensei Rafał Majda 4th dan. Sensei Paweł Pajdak 4th dan (Sosnowiec) was the head referee. The duties of the field referees were fulfilled by masters: Eugeniusz Stanisławek 5th dan (Wałbrzych), Witold Choiński 4th dan (Białystok), Bogusław Plewka 3rd dan (Lubliniec) and Robert Bretner 3rd dan (Kraków). The competition was at very good sports and organizational level. During OYAMA TOP, as always, additional drama was provided by tameshiwarii test, among the group of finalists. Each of the senior fighters had to break boards with the edge of hand (shuto) and and elbow (hiji). Due to the many stiff fights, where it was difficult to point at the winner, the number of broken boards was of a crucial importance in deciding on the results of final fights. 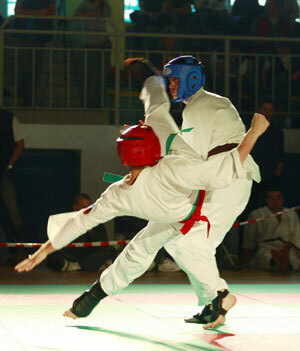 In the formal part of the competition, a group trained by Sensei Andrzej Tomiałowicz 3rd dan from Lubsko presented a striking show with weapons and some self-defence techniques. Sensei Pajdak gave cards to this year's graduates of the Sports Instructor Course (karate instructor). Due to the 30th anniversary of practising karate, Sensei Włodzimierz Rygiert 3rd dan (Turek) was honoured, by Shihan Dyduch, with occacional, congratulatory letter. Shihan Stanisławek handed Sensei Maciej Tomczak (Bydgoszcz) a black belt and a 2nd dan certificate. The winners of the OYAMA TOP category received impressive cups and financial prizes, sponsored by OYAMA PKF. Precious awards were handed by Mr and Mrs Pasha- sponsors and owners of the company „Dragon Sports”.